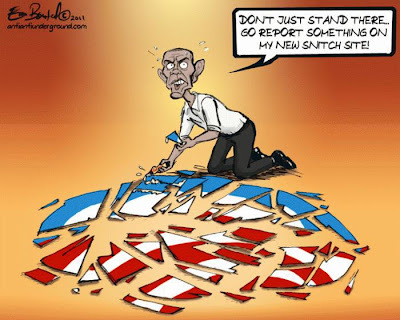 Barack Hussein Obama is attempting to create a generation of "Citizen Snitches" by forming a new website called Attack Watch.com where American citizens can inform the government about websites such as Two Sisters From The Right and other public forums. Targeted are the social networking sites where people dare to exercise their First Amendment right to speak freely in the United States of America without fear of punishment or retribution. Obama supporters can go to the site and register to become informants. It seems that if one disagrees with this administration's policies, and either writes, or speaks out against them, it is considered, not criticism, constructive or otherwise, but rather a "smear" of the president. The information received will go into the "Attack Files." This administration has attempted to gather information before during the debate over Obamacare. By writing to flag@whitehouse.gov people could actually inform the White House on those who opposed socialized medicine in the United States. For a government which claims to despise comparisons to Hitler's Nazi Germany, this administration seems Hell bent on employing the same despicable tactics that were used in 1930s Germany. Under Hitler citizens were encouraged to inform on Jews especially, but also on any one who opposed the National Socialist Party. In fact even the Hitler Youth was so brainwashed that they felt no remorse when they turned in their own family members for the good of the Third Reich. Why this man who pledged to be the person who could unify America employs such tactics is truly perplexing. The government, we are sure, has the capability to monitor any website that it deems suspicious. Once people are registered on the Attack Watch site, what does the government intend to do with the list of names it gathers? Certainly the administration cannot go after every blogger in America or every anti Obama group on Facebook and other social networks. Perhaps those who should most fear the Attack Watch site are the very persons who register their names on it. Certainly that list of citizen snitches will be put to use by the regime at some point in time, and only its founders know what the purpose of gathering all those names is. May we suggest that if the administration has so much time and personnel to spy on American citizens and their opinions, that they perhaps transfer some of those forces to monitor Islamic recruiting sites who speak ill, not only of the government but of all Americans. Those sites are the true danger to our country and to our sovereignty. We deplore the formation of this Attack Watch. It is a blatant violation of our rights to free speech under the First Amendment. We consider it to be unconstitutional, but most of all for Americans, it debases our value system and is completely immoral. Next.. the "Obama Youth Movement" will be asked to report their parents if they express any criticism of "Der Messiah." This is like deja vu.... all over again. Rush had the right idea - log into ATTACKWATCH.com and report everything that has come from the left. Whether it is Maxine Waters wanting permission to "tell us it’s alright and you unleash us" after the POTUS or Jesse (why is he relevant?) Jackson threatening to "cut off his onions", BHO has plenty to worry about from his own camp. Good grief! Is there no end to this man's inappropriate behavior? No wonder he is under attack! He continue to lower the standards of the presidency to the point where people are losing their respect for the highest office in the nation. I just visited attackwatch.com because I couldn't believe such a site existed. And there it was....paid for by "ObamaforAmerica" and asking us to "help stop attacks on the President" before they start. Just HOW are they going to stop them? By doing away with free speech? After all, what they call "attacks" are the expressions of people who are fed up with his heavy-handed tactics and his failed policies. I laughed when I saw the LaRouche PAC's posters of him with a Hitler mustache, but maybe it's not that funny. In fact even the Hitler Youth was so brainwashed that they felt no remorse when they turned in their own family members for the good of the Third Reich was good example.